Even if you took a news vacation over the weekend, you probably heard that the senate voted to confirm Brett Kavanaugh on Saturday. 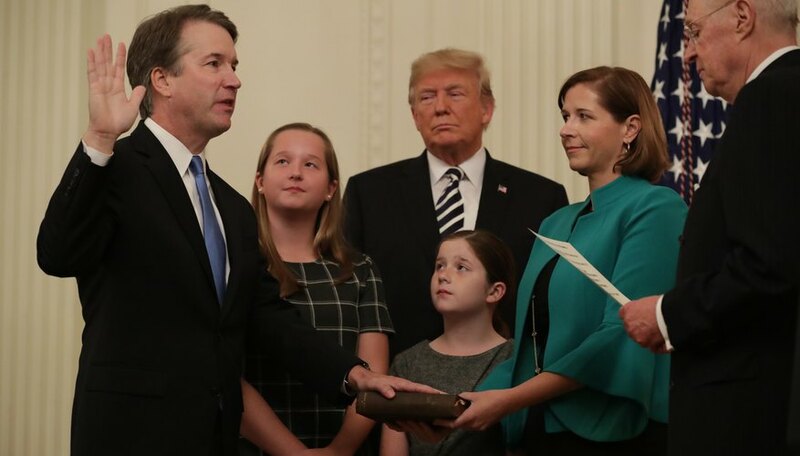 President Donald Trump confirmed him on Saturday night and, as of Tuesday, he takes his place on the Supreme Court bench. Kavanaugh's nomination process was fraught with controversy, but here's one your local news probably didn't cover: his record on the environment. Here's what you need to know. Though Justice Anthony Kennedy (whose seat Kavanaugh takes over) was fairly conservative – he was appointed by former president Ronald Reagan and holds conservative views on issues like abortion – he was often a swing vote on environmental issues. In 2007, for example, he ruled that the Environmental Protection Agency (EPA) had the authority to regulate greenhouse gas emissions under the Clean Air Act. It was a big win for environmentalists, since it confirmed that the EPA had the "jurisdiction" to actually enforce climate laws. In another case, he was open to expanding the types of water protected under the Clean Water Act. If his opinion had been implemented into law, it may have protected more water from pollution. Kavanaugh typically takes a more limited view of how much the EPA should be allowed to actually enforce climate regulations. As a federal appeals court judge, he regularly pushed back against EPA regulations and fought against expanding climate regulations, The Associated Press explains. In other words, his rulings made it harder for the EPA to actually police environmental laws, and set limits on how much they could take measures to fight climate change. And that has a big impact on how measures to fight climate change are actually implemented. If the Supreme Court rules that the EPA can only enforce climate regulations under limited circumstances, it creates loopholes that make it harder to fight climate change. If your head is spinning keeping track of all these climate regulations and who can regulate what, we hear ya. So let's talk big picture. Changing the makeup of the court can impact which cases actually go to the Supreme Court. That's because the Supreme Court has the ability to set precedents. If it rules a certain way on one case, that creates a record that could be used to guide similar cases in the future. So let's say you're an environmental advocate with a case that could go to the Supreme Court. If you know you're facing a more eco-friendly panel of judges – and they're likely to rule in a way you'd like – you'd be more likely to push for the case to get to the Supreme Court. That way, not only might they rule in your favor, it would create a record that would apply to cases in the future – meaning more wins for the environment. Swap out one eco-friendly judge for one that's less likely to rule in your favor, though, and suddenly heading to the Supreme Court doesn't seem like such a good idea. They might rule against you, creating a precedent that could be the first in a series of losses. If you want to cut environmental regulations, the opposite is true. You might sit back and wait while the court tends to rule in favor of environmentalists. But when a new appointment makes the court more likely to rule in your favor, you're more likely to push cases to the Supreme Court. Kavanaugh's appointment might mean that more cases that would challenge environmental regulations would make their way to the Supreme Court – creating precedents that make it harder to combat climate change. Judges on the Supreme Court sit life-long appointments so, short of impeaching Kavanaugh, he's on the court for what's likely to be decades. But Supreme Court justices are nominated by presidents and voted on by the senate, so you can write to your representatives and tell them how you feel. Use our guide to keep up with upcoming climate cases, contact your representatives and, most importantly, register to vote. Making your voice heard keeps up the pressure for the government to address climate change – and, hopefully, appoint judges whose rulings will help the environment. Public Radio International: What would a Justice Kavanaugh mean for the environment? Tremblay,, Sylvie. "How Brett Kavanaugh's Supreme Court Confirmation Could Affect Climate Change." Sciencing, https://sciencing.com/how-brett-kavanaughs-supreme-court-confirmation-could-affect-climate-change-13715406.html. 09 October 2018.